On a Saturday morning in July of 2017 I had the distinct honor to have a brief audience with the Dalai Lama. On Friday evening, Jampa Tenzin, our sales manager (in the photo standing to the left of his holiness) suddenly called me and asked if I wanted to meet the Dalai Lama? For years I had asked Jampa, a Tibetan refugee and an active member of the Twin Cities Tibetan community, if I could have the privilege of seeing the Dalai Lama up-close but he had always responded that the Dalai Lama’s schedule was so tight that when he visited Minnesota, he could only spend a few hours here, and that time, was best spent with the members of the community, state officials and dignitaries. During Dalai Lama’s previous visits, our company had provided the rugs to decorate the stage where a group of monks and nuns sat during religious ceremonies. So we had remained hopeful that one day we would have the opportunity to meet with the Dalai Lama. When I received the call from Jampa Tenzin my answer was a resounding yes! 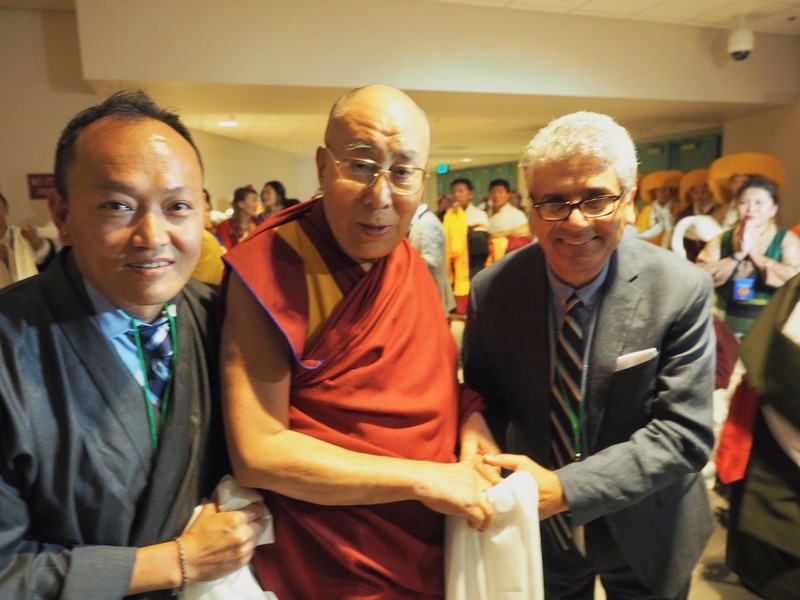 As we stood at one of the doors inside Minneapolis convention center waiting for his holiness’ arrival, Jampa and I were surrounded by a group of elderly Tibetans, handicapped men and women and those with terminal terminal illness. There was also a group of Tibetan musicians who wanted to perform a short traditional song as his holiness was entering the room. After a brief time security detail for the Dalai Lama showed up, quickly checking the room and observing the greeting audience. Soon thereafter came in his holiness. A very robust 80 some years old man with utmost simplicity, devoid of all pretenses and filled with happiness, excitement and a certain youthful exuberance, walked in to the room. Banging on a traditional Tibetan drum carried by one of the band members, the Dalai Lama laughed while greeting the awaiting audience, “above all else” he said “we come to this world to enjoy ourselves.” He then continued ”but enjoyment cannot be attained without compassion. He went on “we must be compassionate to each other and to every one else.” Looking at elderly Tibetans he continued “we must take care of our families and our children and keep our culture alive while in exile.” He then proceeded to bless the sick and the deprived. Compassion and Joy. Sounded simple enough. But hidden in that message was the paradox of acceptance, an essential element in the practice of Buddhism. To accept the difficulties of life and yet remain compassionate and joyful. The door to the large hall opened and hundreds of people, including the elders of the community, women and children monks and nuns, were patiently waiting to hear his holiness, rose to their feet. During our time in the rug business we have decorated many homes, hotels, banks, schools, colleges and churches, but none has given us the satisfaction of decorating the Dalai Lama’s stage. Though seen briefly, our rugs provide the quiet presence required by Tibetan religious leaders who come to Minnesota to visit their exile community. A community in pursuit of a better life. Away from their homeland, that’s been taken by the Chinese, Minnesota has welcomed Tibetan refugees to worship and pray as they wish and to grow their children with the promise of one day returning to their homeland.